The image on our website banner is the view from our rooftop. Meros means 'cultural heritage' in English, and the Matkarimov family is steeped in Uzbek culture. Their great-great grandfather was a master artisan (usto in Uzbek) engaged by the Khivan Khans. 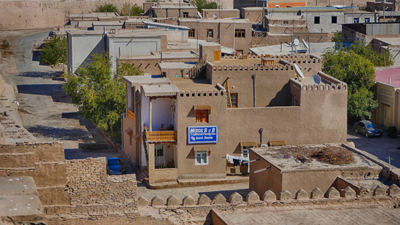 Sadulla Matkarimov, father of the owner, worked for more than 20 years on the restoration of Khiva during Soviet times. Quranbay Matkarimov, the owner, is a master of pattern design and restoration. He has worked on restoration projects in the World Heritage centres of Bukhara and Shaxrisabzand. He was chief restorer of the decorated ceilings of Khiva. 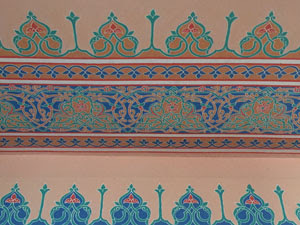 The ceilings in the Meros guestrooms are painted in this classical, Khoreziam style - they are stunning. Mr. Matkarimov's son, Jaloladdin, manages the guest house on a day-to-basis. He can assist visitors with transfers to/from the airport, tours of Khiva, tours to the desert castles of Khorezm, car hire and all your travel needs. Jaloladdin can also book train train and flight tickets within Uzbekistan for you. All 7 rooms of the guest house have private bathrooms. Some include verandahs. The view from the rooftop is spectacular and private dinners can be served there. The family can also provide a bread making master class for small groups at a modest fee. Bicycles are available for rent.